Idoma people from home and abroad gathered to celebrate Eje-Aje K'Idoma with the charge to be security conscious and always report strange movements in and around their areas to security agencies. Agabaidu Chief Elias Ikoyi Obekpa Och'Idoma the 4th gave this charge on Saturday at his palace in Otukpo, to commemorate the celebration of this year’s ‘Eje-Aje K’Idoma’. The paramount Ruler warned that the issue of security should not be rested in the hands of only the government and Security operatives but all hands must be on deck to strengthen internal security so as to contain the spate of rising insurgency within and outside the land. He cautioned the Youths to be law abiding citizens and shun cultism or any act capable of desecrating the land. “One of the reasons why we see calamities and natural disasters happening frequently nowadays is because the land has been desecrated. Anyone who engages in any act that will result to spilling of blood has already desecrated the land and not until such land is concentrated and an atonement made, the misfortunes will continue. “The Youths should therefore shun any act that could lead to blood spilling in Idoma land”, he added. The Och’Idoma also used the forum to call on Idoma political leaders to unite and chart the way forward for Idoma nation even as he enjoined those who lost elections to forget the past and move on in the spirit of unity and peace while those who were successful should carry everyone along, including their opponents at the polls. 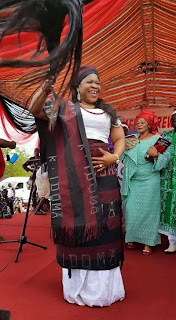 Highlight of this year’s ‘Eje-Aje K’Idoma’ was the conferment of the honourary Chieftaincy titles of ‘Ofianya K’Idoma’ on Senator David Mark’s daughter and wife of the wife of Dr. Innocent Onuh, the Caretaker Chairman of Otukpo Local Government Area, Mrs. Blessing Onuh, and ‘Oyalewa K’Idoma’ on Chief Sunday Adakole Amuta.